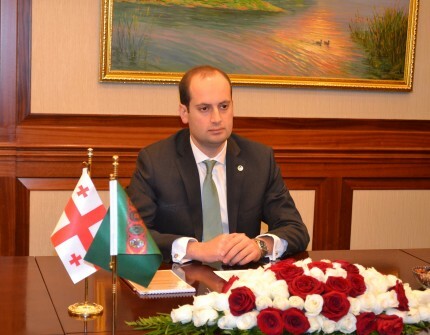 On November 29, 2017 in the building of the hotel "Oguzkent" Deputy Chairman of the Cabinet of Ministers, Minister of Foreign Affairs of Turkmenistan R.Meredov had a meeting with the Vice-Premier of the Government of Georgia, Minister of Foreign Affairs Mikheil Janelidze. The sides noted with satisfaction the dynamic nature of the development of interaction between Turkmenistan and Georgia and expressed their full commitment to their further development. An exchange of views took place on issues of bilateral cooperation. Noting the prospects for expanding international transport cooperation, the parties outlined plans for the future to develop modern mechanisms that meet the real goals and requirements of the partnership. Speaking about the energy policy of Turkmenistan, which determines the content and direction of the proposals and practical actions of the country in this field, the sides expressed interest in consolidating efforts in the development of international energy cooperation. Defining new opportunities for further expansion of cooperation, the sides noted the need to intensify the existing mechanism of cooperation between the foreign ministries of the two states.